Today started off early. Very early. I was up before the sun and driving the 35 minutes to the fertility clinic for blood work and ultrasound. I had to be there and back before Ed left for work. The appointment was easy - and when they called me later with my blood test results I got the plan for my next step. Currently I take two injections a day - one in the morning and one at night. This Sunday I will hop to four injections at night...and Ed and I will both go on a strong dose of antibiotics. The antibiotics are necessary to prevent bacteria from affecting our egg and sperm. And the next round of injections are to stimulate my ovaries to produce eggs. The next time I go back is a week from today. I got home just in time to get the boys up and dressed for the day. 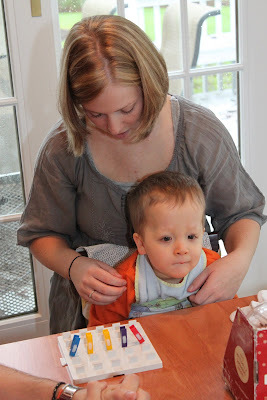 Right after breakfast was Gavin's Occupational Therapy with Miss Stephanie. He was not a willing participant today...no matter what she tried! He didn't want her to touch his hands...he didn't want to play any games...he just wasn't into it. At all. Brian spent the day doing anything and everything for attention. Especially mine! During Gavin's OT, he cracked us up by army crawling under the table - mission impossible style - to sneak a peek at Miss Stephanie's toys. Later, during an interview for a new helper, he started screaming for no reason - just so I'd look at him. I guess he's a good barometer - if they can handle his antics with grace they get interview bonus points!! But, boy, is he developing a mischievous side. I think it's time to read the "Super Nanny" book before disciplining becomes an impossible mission! But look at that face. How can I say no to that face? ?